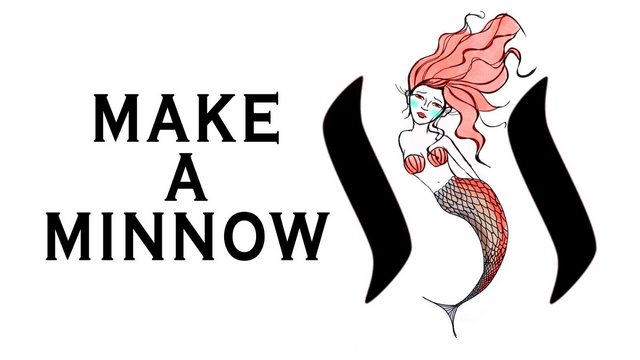 Make a Minnow official Guidelines updated! This initiative is about awarding a minnow who creates quality content and supports fellow content creators in a community under the PAL/MSP umbrella and giving them a delegation prize as a reward for their efforts! Giving our minnows the opportunity to have increased curation influence benefits the entire Steemit ecosystem and should be considered a great honor. There are typically two Make a Minnow (MaM) Contests per month, but the exact schedule is determined by the organisers and sponsors. The winner of each Contest is awarded a 5000SP delegation for 4 weeks and additional perks (see below). Each Contest is held in two rounds: The Nomination Round and the Voting Round. All Contest posts are made from the @msp-makeaminnow account and resteemed by @minnowsupport on Steemit. Post rewards are used to power up the @msp-makeaminnow account. Each Contest will have three posts as detailed below. The First post announces a new MaM Contest and its rules. The post also signifies the start of the Nomination Round. Nominations (eligibility conditions described below) are made as comments on this post. Nominations may also include a link to a post in support of the nomination. Eligible voters have one week to complete this step. Nominee Selection for the Voting Round. A nominee requires at least two valid nominations to go into the Voting Round. The top three nominees, by count of valid nominations, go into the Voting Round. In the event of a tie, more than three nominees may go into the Voting Round. The Second post announces the start of the Voting Round and lists the nominees that have been selected. Eligible voters that nominated during the Nomination Round have one week to comment on the second post with their vote from the list of selected nominees. Winner Selection, the winner is the nominee who receives the most valid votes in the Voting round. There is a single winner: in the event of a tie, a dice roll will take place on the MSP discord to determine the winner. This will be done by the MaM organizer with at least two moderators as witnesses. The Third post announces the MaM Contest winner and signifies the end of the Contest. gains membership to (and voting rights in) the chatroom for MaM Founders. This body governs the MaM contest. MaM may award extra prizes to runners up depending on availability of sponsorship. Extra prize awardees are not considered MaM Winners but remain eligible to win MAM in the future. We may elect to restrict bonus prizes to repeat bonus prize winners. Vote in the Voting Round if they also nominated in the previous post. Past winners can always vote in the voting round. Nominators who do not vote in the voting round will have their nominatee counted as a vote. Any MSP registered member who has less than 10000 SP and is a delegating member of the PAL/MSP discord( minimum 10SP) and has a minimum of t!rank 5 with our tatsumaki bot. As stated above: This initiative is about awarding a minnow who creates quality content and supports fellow content creators in a community under the PAL/MSP umbrella and giving them a delegation prize as a reward for their efforts! Please keep this in mind when nominating because your decision reflects upon you too. You may not nominate yourself! The present Organizers are @juliakponsford and @clayboyn. Exciting news! We now have a bot helper! The prizes are covered by our generous sponsor @eturnerx. Please contact the MaM Organizers or sponsor if you would like to become a sponsor. @eturnerx, @sammosk, @aggroed, @followbtcnews, @freetissues, @crimsonclad, @overthewait, @inkatieskitchen, @misterakpan, @stitchybitch, @danielsaori, @kubbyelizabeth, @morodiene, @drakos, @inquiringtimes, @artsygoddess, @overkillcoin, @kerlund74, @stickchumpion, @torico, @buzzbeergeek, @crazybgadventure, @dbzfan4awhile, @steembusiness, @juliakponsford, @locke, @r0nd0n, @buggedout, @hopehuggs, @soundwavesphoton, @clayboyn, @drwom, @darxide403, @shellyduncan, @uniwhisp, @sunravelme, @travelnurse, @jackmiller and @spaingaroo. Founders are the people who were behind the MaM Contests from the beginning. Founders have access to the MaM chat room where they can have input into the future of this project. Founders are not otherwise directly involved in the running of individual MaM Contests and may be nominated unless otherwise excluded. i nominate danielsaori as thebestdevindawholewideworld! I nominate @soundwavesphoton because he is the dang homie and likes cool stuff. !